The new 20-page full-color summer/fall 2009 catalog for BMH Books, Winona Lake, Ind., is now printed and available for distribution. New releases since the last catalog include the Todd Scoles and Cover/Rife books on Grace Brethren history, Bruce Triplehorn and Scott Aniol’s books on worship, Dan O’Deens’ ABS of Faith on building spiritual muscle, two Lehman Strauss commentaries on Daniel and Revelation, and Dr. Larry McCall’s latest book, Loving Your Wife as Christ Loves the Church. The catalog now includes 130 discrete products, ranging from commentaries to historical charts to tracts and more. Separate sections of the catalog display the works of BMH’s major authors, Homer Kent, John Davis, and John Whitcomb. There is a section especially for Grace Brethren history and doctrine products, which includes the new Scoles book on Grace Brethren history and the Heroes Who Live On, Vol. 3. Two full indexes, by author and by title, make the catalog user-friendly and a back-page order form makes ordering convenient by fax, by phone, or by mail. 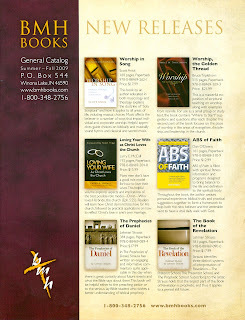 Catalogs are available in any quantity needed for churches and individuals without charge. To order yours, call 1-800-348-2756 or e-mail jleonard@bmhbooks.com. All BMH products are available online for purchase at www.bmhbooks.com.